Total expenditures authorized by the budget increased by 11 percent for a total of more than $251 billion in 2017. Despite increased investment in some services, the budget did not adequately prioritize investments in critical sectors of the economy. Inadequately funding core sectors of the economy critical for creating good paying jobs, attracting investments and increasing market confidence is likely to undermine economic growth. Investments in early childhood and tertiary education, community development, and economic opportunities are either lagging or declined. Likewise, funding for justice administration remains stagnant despite backlogging of caseloads, while investment to ensure the transparency, efficiency, and integrity of the electoral system was cut by 43 percent despite tacit indications by the government to invest in biometrics in the electoral system. Increased allocation for wages, salaries, and benefits represents half of the $11.2 billion increase in total revenues, largely due to salary increases of up to 50 percent for members of the general assembly and special offices. Further, the budget shifts more public funding to general administration such as governance and diplomacy, raising critical questions about the economic rationale behind these allocations. Improving public sector efficiency and reducing the cost of government is necessary to free up resources for funding critical services such as education, economic opportunities and community development. Unless brought under control, the growing cost of government would force either higher taxes on households or further cuts to vital services in future budgets. The budget includes changes in the tax laws making the tax system more regressive – unfair to lower income families. Specifically, changes in the tax laws shift additional tax burden ($14 billion or 21 percent over 2016) mostly on households in the form of higher consumption tax revenues. Simultaneously, income tax revenues are reduced by 3 percent (almost $1.8 billion). With a consumption tax, low-income families pay a higher share of their income in taxes than everyone else. Accordingly, shifting more of the tax burden to consumption-based taxes makes it more difficult to lift struggling families out of poverty, put them on a path to economic independence, and reduce inequality – none of which are good for short or long-term prosperity. Overall funding for public education increased by 10 percent for a total of $40 billion. However, funding for early childhood education and post-secondary/tertiary education grew the least by 1 percent and 3 percent, respectively, over 2016. Adequately investing in early childhood education is key to building a skilled labour force and a strong economic foundation for long-term prosperity. Research shows that a good quality early childhood education improves performance and outcomes at higher levels and increases the chances of children from low-income families escaping the poverty trap. Likewise, adequate funding for post-secondary/tertiary education is essential for preparing workers for the workforce and for driving research and innovation, both of which are critical for long-term economic prosperity. Funding for community development increased insignificantly over 2016, despite an overall increase of 15 percent for health & human services. Failure to adequately fund community development initiatives weakens the ability of local governments and communities to build vibrant local economies capable of attracting businesses, encouraging investments, and creating good paying jobs. Ensuring communities are clean and safe are necessary for promoting good public health for families to lead healthy and productive lives. Yet, many communities are still suffering from poor drainage and irrigation services, roads, water supplies, and garbage disposals. These reduce the quality of life of residents and the economic attractiveness of communities. Cutting an already low level of funding for creating economic opportunities is likely to constrain economic growth. Compared to 2016, the budget cuts funding for creating economic opportunities in the agriculture sector by 3 percent and natural resources and the environment by less than a percent. Total funding for economic opportunity represents just 9 percent of total government spending. Cuts to the agriculture sector are likely to worsen its current decline leading to more jobs and income losses. In 2016, agriculture output declined by 10 percent. The agriculture sector employs 21 percent of the country’s workforce. The continuous decline in this sector is likely to have a negative pass-through effect on other sectors further limiting overall economic growth. The cost of general government services (mostly the executive branch) consumes 18 percent – the second largest share – of total government expenditures. The high and growing cost of the general government services raises critical questions about the efficiency of government in delivering services and whether the benefits of these services are greater than what they cost taxpayers. For example, increased funding of almost $1.4 billion for the Ministry of Presidency and Office of the Prime Minister for 2017 roughly equals total funding for Region number 8 ($1.6 billion) for providing all services. Similarly, total funding for the Ministry of Foreign Affairs is almost equal to total funding for community development ($5.2 billion and $5.9 billion, respectively). For an economy of fewer than 750,000 people seems rather high. In fact, funding for the Ministry of Foreign Affairs for 2017 increased 29 percent while funding for economic opportunities declined. The logic and economic rationale behind these allocations are at best unclear. 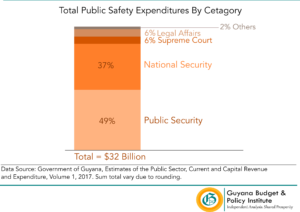 Funding for the justice administration (Supreme Court) represents just 6 percent of total public safety expenditure. This low level of funding limits the Court’s ability to deliver justice in a timely and efficient manner. The budget also cut funding for the Guyana Election Commission by 43 percent. Cutting funding for increasing transparency and protecting the integrity of the electoral process undermines both the democratic and economic future of the country. It is also likely to discourage businesses, particularly foreign businesses, from considering investing in Guyana of fear of future economic instability from civil unrest, crime and other ills associated with a lack of confidence in the country’s democratic institutions. Revenue Side: How is the Budget Funded? 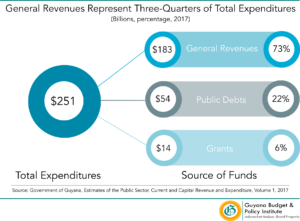 Expenditures authorized in the national budget are financed from three main sources: government revenues, grants from donors, and borrowing, or the issuing of public debt. In 2017, the budget includes total expenditures of more than $251 billion. General Revenues of $183 billion – representing 77 percent of total expenditures. Grants from Donors of $14 billion – representing 6 percent of total expenditures. Issuing of Public Debt of $54 billion – representing 17 percent of total expenditures. The budget includes general revenues of almost $183 billion for 2017, which represents a decline of 3 percent (almost $6 billion) over 2016. 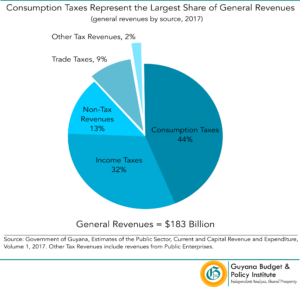 The largest sources of total government revenues are consumption taxes, representing 44 percent ($80 billion) followed by income taxes, which represent 32 percent (almost $59 billion). Increased revenues from consumption taxes by 21 percent (almost $14 billion) over 2016 for a total of $80 billion in 2017. Reduced revenues from income taxes by 3 percent (almost $2 billion) over 2016 for a total of almost $59 billion in 2017. Reduced non-tax revenues from businesses (private sector) by 27 percent (almost $3 billion) over 2016 for a total of almost $8 billion in 2017. 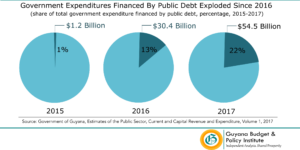 Reduced non-tax revenues from state-owned enterprises by 125 percent (more than $17 billion) over 2016 for a loss of more than $3 billion in 2017. The budget includes estimated grants totaling more than $14 billion, an increase of 83 percent ($6.4 billion) over 2016. Grants from donors are of two broad categories: (1) Grants from the Highly Indebted Poor Countries (HIPC) initiative, and (2) Grants for projects to support national development. Of the total $14 billion, 17 percent is expected from the HIPC initiative and 83 percent from projects and project-related grants. The budget includes new public debt totaling more than $54 billion, an increase of more than 79 percent (more than $24 billion) over 2016. Of this amount, 80 percent would be issued to domestic lenders and 20 percent to international lenders. In 2017, the share of government expenditure funded by new public debt increased to 22 percent, up from 13 percent in 2016. 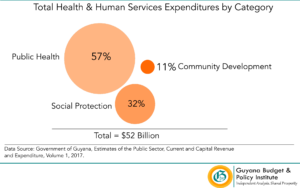 In 2015, the share of government expenditure funded by new public debt was 1 percent. Expenditure Side: How are Public Funds Spent? This section of the report examined how funds appropriated in the national budget are spent according to the different services and policy priorities. 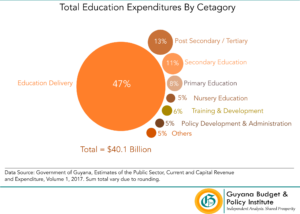 Funding for education delivery expenses totals almost $19 billion, representing almost half to total education funding. This amount represents an increase of 10 percent of 2016. Funds for education delivery are transfers from the central government to the ten Regional Democratic Councils (RDCs) that manage the delivery of education within each region. Funding for early childhood education (nursery education) totals almost $2 billion, representing 5 percent of total education funding. This level of funding represents an increase of 1 percent over 2016 – the smallest increase in all categories of education funding. Funding for primary education totals more than $3 billion, representing 8 percent of total education funding. This level of funding represents an increase of 18 percent over 2016. Funding for secondary education totaled almost $4.5 billion, representing 11 percent of total education funding. This level of funding represents an increase of 18 percent over 2016. Funding for training and development totals more than $2 billion, representing 5 percent of total education funding. This level of funding represents an increase of 12 percent over 2016. Funding for post-secondary/tertiary education totals more than $5 billion, representing 13 percent – the second largest share – of total education funding. This level of funding represents 3 percent over 2016. Funding for the community development totals almost $6 billion, representing an increase of 1.4 percent over 2016. Funding for public health (including transfers to all Regions for healthcare services) totals almost $30 billion, representing an increase of 14 percent over 2016. Funding for social protection totals almost $17 billion, representing an increase of 20 percent over 2016. Funding for public security totals more than $17 billion, representing an increase of 24 percent over 2016. Funding for legal affairs totals more than $0.6 billion, representing a decrease of 64 percent over 2016. Funding for national security (Guyana Defense Force) totals almost $12 billion, representing an increase of 12 percent over 2016. Funding for the supreme court totals almost $1.8 billion, representing an increase of 3 percent over 2016. Funding for multiple commissions (e.g. ethnic relations, public service, public procurement, etc.) totals more than half a billion, representing an increase of 26 percent. This increase was largely the result of a 17 percent funding increase for the Rights Commission and new funding totaling $76 million for the Public Procurement Commission. Funding for creating opportunities in the agriculture sector totals almost $21 billion, representing a decrease of 3 percent over 2016. Funding for creating opportunities in natural resources and environment sectors totals almost $0.8 billion, representing a decrease of almost 2 percent over 2016. Funding for creating business opportunities in sectors such as tourism, industry, and commerce totals $1.7 billion, representing an increase of almost 50 percent over 2016. Funding for maintaining and upgrading roads, bridges, waterways, airports, etc. totals $38 billion, representing an increase of 14 percent over 2016. Funding for maintaining and upgrading telecommunication services totals $2.3 billion, representing an increase of almost 100 percent over 2016. Funding for the Ministry of Finance totals almost $25 billion, representing a decrease of 6 percent over 2016. Funding for the Ministry of Presidency totals $6 billion, representing an increase of 24 percent over 2016. Funding for the Office of the Prime Minister totals almost a billion, representing an increase of 34 percent over 2016. Funding for the Ministry of Foreign Affairs totals more than $5 billion, representing an increase of 29 percent over 2016. Funding for the Guyana Elections Commission totals $2 billion, representing a decrease of 43 percent over 2016. The budget allocates almost $16 billion for meeting public debt obligations, representing an increase of 29 percent over 2016. 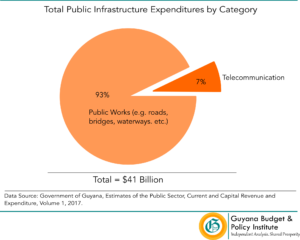 Government of Guyana, Estimates of the Public Sector, Current and Capital Revenue and Expenditure. Volume 1. Appendix D. p.684. Institute on Taxation & Economic Policy (ITEP). Who Pays: A Distributional Analysis of the Tax System of All 50 States, Fifth Edition. January 2015. Executive Office of the President of the United States. The Economics of Early Childhood Investments. January 2015. Bank of Guyana, Annual Report 2016. Table 10-II. p.146. GDP figures used are based on 2006 dollars. World Bank, Data, Countries and Economics, Guyana. The data used is for 2002, the latest year for which such data is available. Refers to the amount of debt issued in 2017 alone. This amount should not be confused with the total amount of debt for the country. Total Education expenditure equals total budget allocation to the Ministry of Education plus total transfers to the Regional Democratic Councils for Education Delivery. Total Health & Human services expenditure equals total budget allocation to the Ministry of Health, Ministry of Social Protection and the Ministry of Communities plus total transfers to the Regional Democratic Councils for health care delivery services. Total Public Safety expenditures equals total budget allocation to the Ministry of Public Security, Ministry of Legal Affairs, Guyana Defense Force, and the Supreme Court. 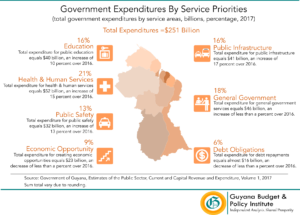 Total Economic Opportunity expenditures equal total budget allocations to the Ministry of Agriculture, Ministry of Natural Resources & Environment, and the Ministry of Business plus total transfers to the Regional Democratic Councils for agriculture services. Total Public Infrastructure expenditures equals total budget allocation to the Ministry of Public Infrastructure and the Ministry of Communications plus total transfers to the Regional Democratic Councils for public works. 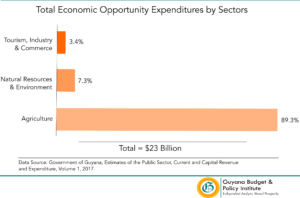 Total General Government expenditures equal total budget allocation to the Ministry of Presidency, Office of the Prime Minister, Ministry of Finance, Ministry of Foreign Affairs, Ministry of Indigenous People’s Affairs, Parliament Office, Office of the Auditor General, Public and Police Service Commission, Teaching Service Commission, Guyana Election Commission, and transfers to the Regional Democratic Councils for administration expenses. I must commend you for your detailed analysis. being someone who worked and managed a sub program budget, but now no longer in government system it pains to hear the great difficulty they complain about not having skilled and competent people to implement the PSIP . Where is the “value for money “audits , some of the activities in the govt system are useless and provide no outcomes. Why invest in human resources “monitoring n evaluation” when the fruits from these analysis are not utilized in programme planning and programme budgeting?